A few evenings ago, Johanna and I went to Café Athen to listen to a lecture about Lund alumni in Swedish politics. Keynote speaker was Ingvar Carlsson, leader of the Swedish Social Democratic Party 1986-1991 and Prime minister in Sweden 1986-1991 and 1994-1996. He commenced his studies in political science at Lund University in 1956 and took his degree two years later to start his career at the age of 23 in the Swedish Prime Minister Office. However, it was not just the academic studies that left him with many fond memories from Lund. Ingvar Carlsson met his future wife Ingrid in Lund, he was an active member of Västgöta Nation, Utrikespolitiska Föreningen (The Association of Foreign Affairs) and spent many evenings in Café Athen in the AF-building. 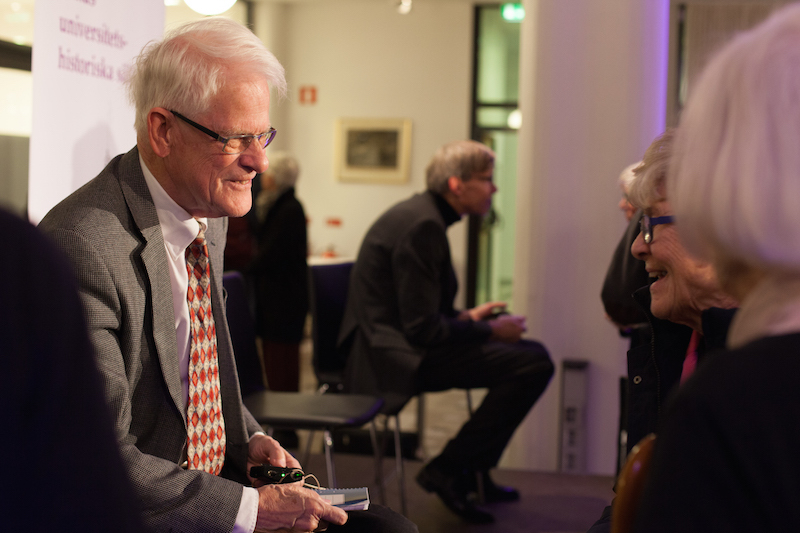 During the his speech, Ingvar Carlsson discussed the importance of his time at Lund University for his career as a politician and also the importance of research in a democratic society. Universities, facts and research certainly play an important role in meeting the challenges our society faces today and in the future. Of all the amazing things I have experienced over the years, my two years in Lund are the best! Tage Erlander, Ernst Wigforss and Östen Undén are three other alumni from Lund University who have played important roles in Swedish politics during the 1900’s. Interested in dusting off your Swedish history skills? Check out the Lund University 350th Jubilee book “Lund University over 350 years“. The presentation was a part of a lecture series by the Royal Physiographic Society in Lund and Lunds universitetshistoriska sällskap organised for the Lund University 350th Jubilee Celebration. This entry was posted in Inspiring alumni. Bookmark the permalink.